Emily is Asking You to GiveBIG! Emily Tomita is the Youth Program Manager at Refugee Women’s Alliance (ReWA) where she serves families and children in Southeast Seattle. Through her participation in SESEC’s Advocacy and Policy Cohort she has learned how to better advocate for the families with which she works. She also believes strongly in supporting her local community and working in collaboration to solve problems and grow her network of support for the families she works with. Recently Emily applied for a fellowship with a local philanthropic organization to learn more about foundations and philanthropy. This type of opportunity grows the network of support for students of color and forwards SESEC’s mission of closing the opportunity and achievement gap for students of color. I look forward to attending SESEC meetings every month. Selfishly, I love them, because they give me a chance to meet new people, learn about something new and powerful, and bond with others over cheesy snacks. Professionally, these meetings have helped me grow my network, strengthen my background knowledge, and ultimately make me better at my job. 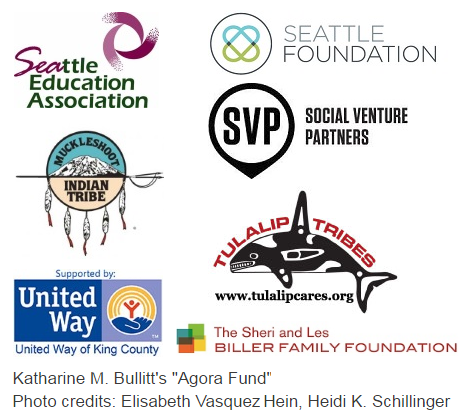 SESEC provides a dedicated time and space for educators, parents, and community providers to come together and tackle one of the toughest problems facing Seattle today: equity in education for children of color. I am grateful to SESEC for providing this much needed space for collaboration and learning, as well as encouraging me to hone my advocacy and publicity skills in service of this goal. As a participant in SESEC’s 4th Advocacy and Policy cohort, I acquired tools and strategies to make my efforts to advance racial equity more effective. This work is too important to be doing it alone. Youth of color in Southeast Seattle deserve better. As Erin is fond of saying, it’s all about relationships. Though the collaboration and relationship-building we do at SESEC events, I feel hopeful about what we can all achieve together. Through early giving, you can conveniently schedule your online donation. If you don’t want to preschedule your donation, please remember that May 9 is when you can make your GiveBIG donation.